Heat oven to 350°F. In large bowl, break up cookie dough. Stir or knead in 1/4 cup all-purpose flour until well blended. Shape dough into 36 (1-inch) balls. Bake 10 to 14 minutes or until edges are golden brown. Cool 1 minute; remove from cookie sheets to cooling rack. Cool completely, about 5 minutes. In small microwavable bowl, microwave vanilla chips and vegetable oil uncovered on Medium (50%) 2 to 3 minutes, stirring once halfway through microwaving, until melted. Stir until smooth. Dip half of each cookie into melted chips mixture, allowing excess to drip off; place on waxed or parchment paper-lined cookie sheets. Sprinkle each with about 1/2 teaspoon crushed candy. Let stand until set. 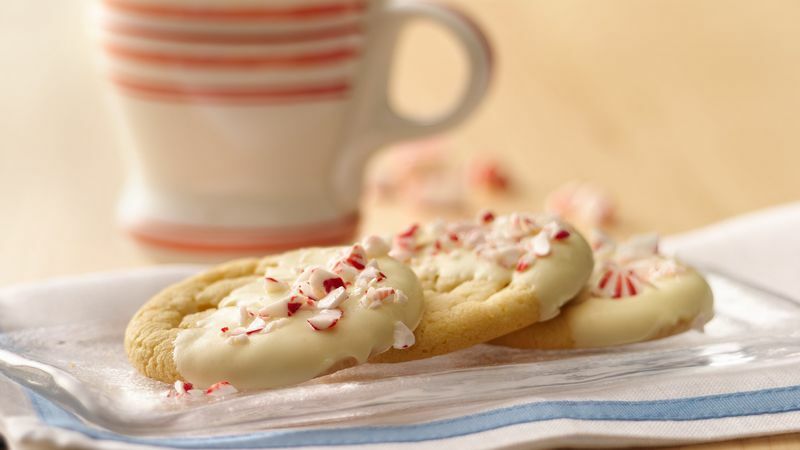 Make cookies doubly minty using Pillsbury peppermint cookie dough for the sugar cookie dough. Look for peppermint cookie dough in the refrigerator case during the holidays. Substitute crushed candy canes for the crushed peppermint candies if desired.